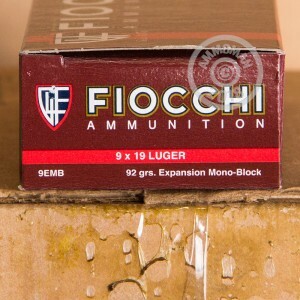 This 9mm Luger ammunition from Fiocchi is a lead-free defensive load with a few distinctive features. The projectile, dubbed "Expansion Mono Block" by the company, is a one-piece design weighing only 92 grains. To enhance the penetration of the lighter round, these bullets are not made from solid copper but from a harder copper-brass alloy. A high muzzle velocity of 1,325 feet per second complements this setup and helps ensure better expansion. 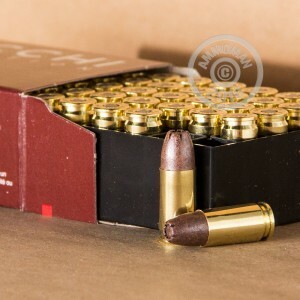 Like other Fiocchi ammo, these cartridges use non-corrosive Boxer primers and brass cases. 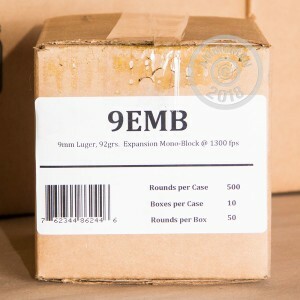 Each box contains a generous 50 rounds so you can spend your money on ammo instead of packaging!